The Galleria Menorah Program will feature addresses by prominent citizens and dignitaries, a children’s choir, and a short presentation. Chanukah treats will be served to the crowd and special Chanukah gifts for children. 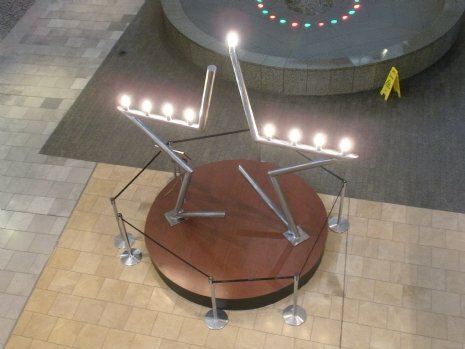 The beautiful Menorah was designed especially for the Galleria. It is a handcrafted masterpiece. Standing 12 feet high, it gracefully extends upwards in the shape of the famous Magen Shlomo – Shield of Solomon (The Lone Star). Local artist Isaac Cohen was commissioned to create and produce this magnificent work entirely out of brilliant steel materials. The Holiday of Chanukah contains a universal message for people of all faiths; namely that good will ultimately triumph over evil, freedom over oppression, and light over darkness. The Chanukah Menorah teaches us yet another message: Just as we kindle an additional candle each night of the holiday, so too must we perform additional acts of kindness and goodness. We must not be satisfied with the goodness performed yesterday.